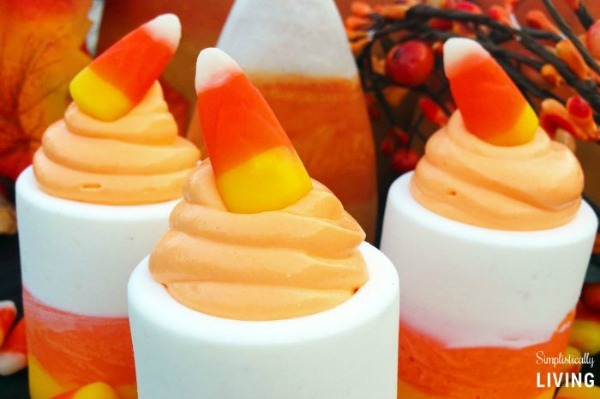 These delicious Candy Corn Recipes have you seeing candy corn in a whole new way! It’s not just for snacking or handing out for Trick or Treat. You can use candy corn to make many delicious treats and desserts. October 30 is National Candy Corn Day. Many national days are associated with food. What more perfect way to celebrate than with one of these sweet treats that feature the candy front and center? Find out all about these special days in my National Days Guide. For another fun food day in October, check out my post on National Cake Decorating day for some fun tips and recipes. And for another national sweet treat day, Check out National Licorice Day on April 12. Candy corn is one of the most popular Halloween candies. And did you know that there is also a national candy day? October 30 is National Candy Corn Day! If you have been reading my blogs lately, you will have seen that I’ve been on a candy corn mission lately. Pretty much everything you can do with it to make it into a dessert, I have tried. Some were flops. Some were huge successes. All were full of the taste of fall. 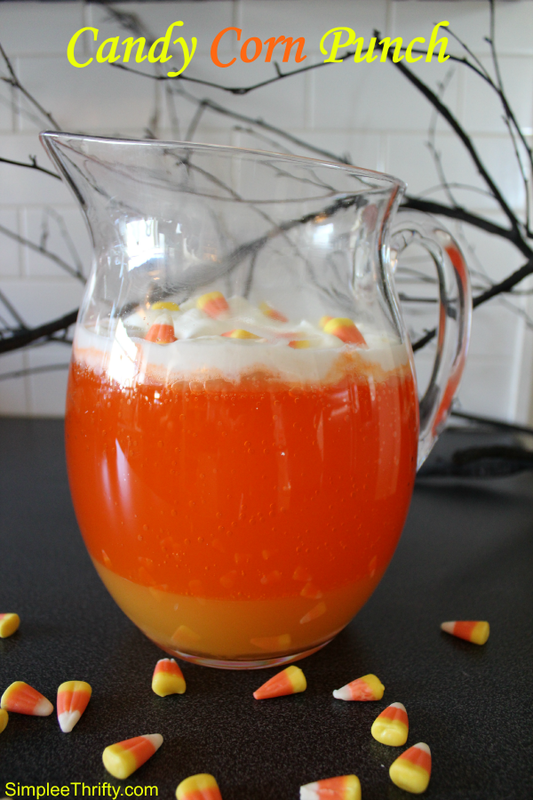 I thought it would be fun to bring all my candy corn recipes as well as some of my favorites from my blogging friends into one round up. The recipes are the perfect way to celebrate this National Day! 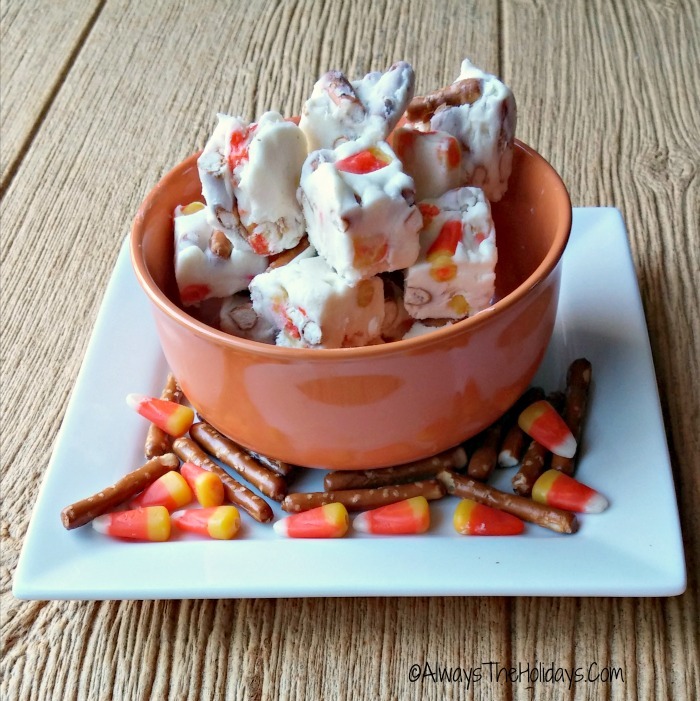 Candy corn is not just snacking from a candy jar or handing out to trick or treaters. You can also use this fun candy as an ingredient in homemade Halloween and Thanksgiving candy treats or to make cute seasonal crafts. 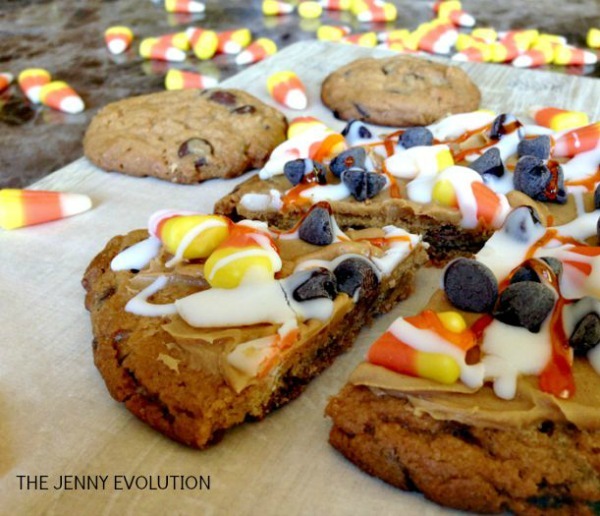 Give everyone’s favorite Halloween candy some love by incorporating it into one of these great recipes! These candy corn recipes will bring the taste of Halloween and Thanksgiving to your dessert table. 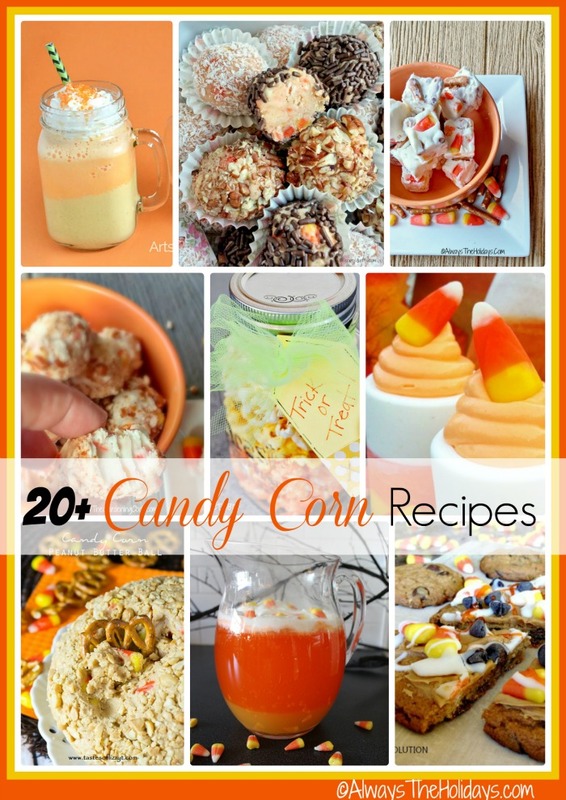 This round up is for dedicated candy corn lovers of all ages! Those who dig into it by the handfuls and can’t get enough of this sweet holiday treat. The candy corn recipes feature both treats that feature the actual candy corn and some “pretenders” who just use the color for inspiration. All are downright delicious and will leave your holiday guests asking for more! These candy corn truffles are so tasty. If you are not a huge fudge lover, you’ll still like these delicious bites. They are sweet, but not overly so. The cookies inside the truffles make them sort of like a cake pop, and the coatings tone down the sweetness. One delicious bite! 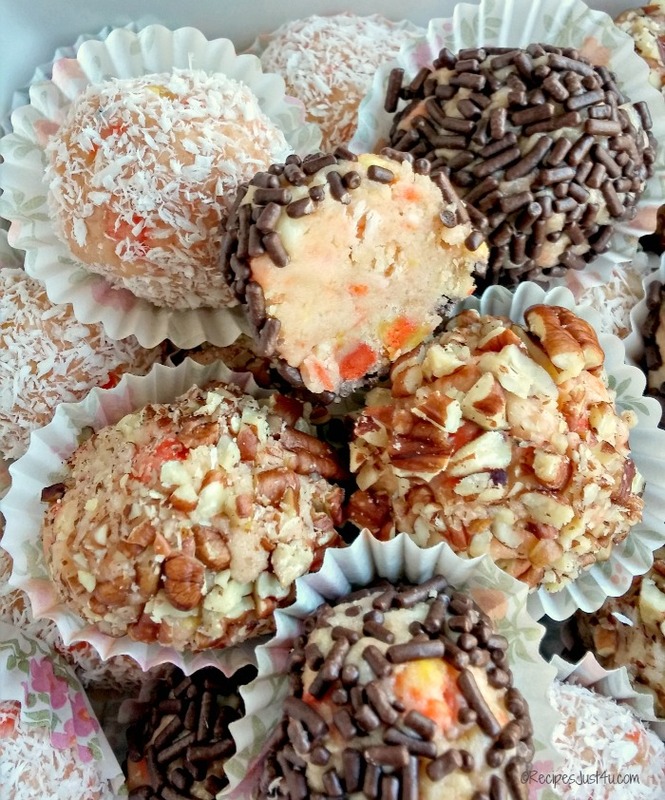 Get the recipe for these candy corn truffles here. This candy corn pecan fudge has all of my favorite holiday goodies in it ~pecans…marshmallow cream…candy corn…white chocolate, and the surprise ingredient of Golden Oreo cookies. It all comes together in one decadent tasting pan of fudge that your holiday guests will just love. See how to make it here. It’s the holidays, after all – Time to splurge. Let’s just wash down these delicious candy corn sweets with a big ole glass of candy corn punch! See how to make it here. These delicious squares are 175 calories of sugar, cream, marshmallow and more. This candy corn fudge is very sweet. Only one piece is all you need to answer your sweet tooth! Get the recipe. Forget brownies. 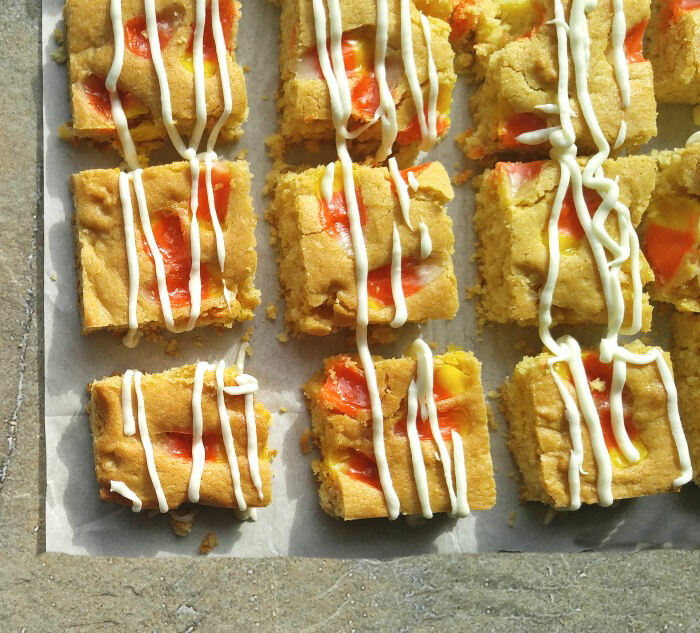 Instead make a batch of these candy corn blondies. They are easy to make and super tasty. I love the icing drizzle on top. 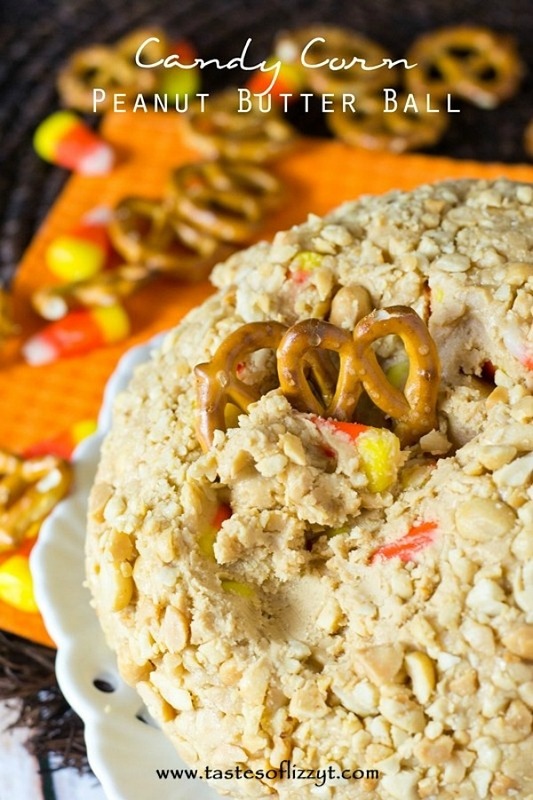 This decadent party dip combines the seasonal taste of candy corn with peanut butter. Oh my, oh YES!! (peanut butter is a food group to me!) Perfect to dip into with pretzels. See how to make it on Taste of Lizzy T.
This is a sweet treat that you can indulge without worrying about all the calories. These candy corn pudding pops can even be made with skim milk and sugar free pudding mix. Ready in a flash and perfect for an Indian summer day. Get the recipe here. This recipe came about when some of my fudge did not work out the way I wanted it to the first time I made it. 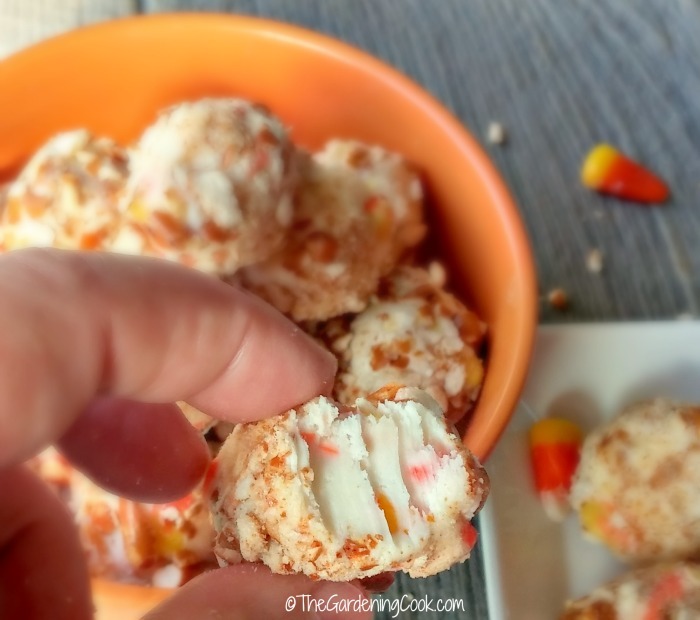 Rather than throw it all away, I remade the recipe into these decadent candy corn pretzel balls. Super tasty and just the right consistency, PLUS…I learned about the soft ball fudge technique too! See how to make them here. These candy corn edible shot glasses from Simplistically Living are so colorful. Perfect for the season! And the kids can eat them too. There is no alcohol in them. 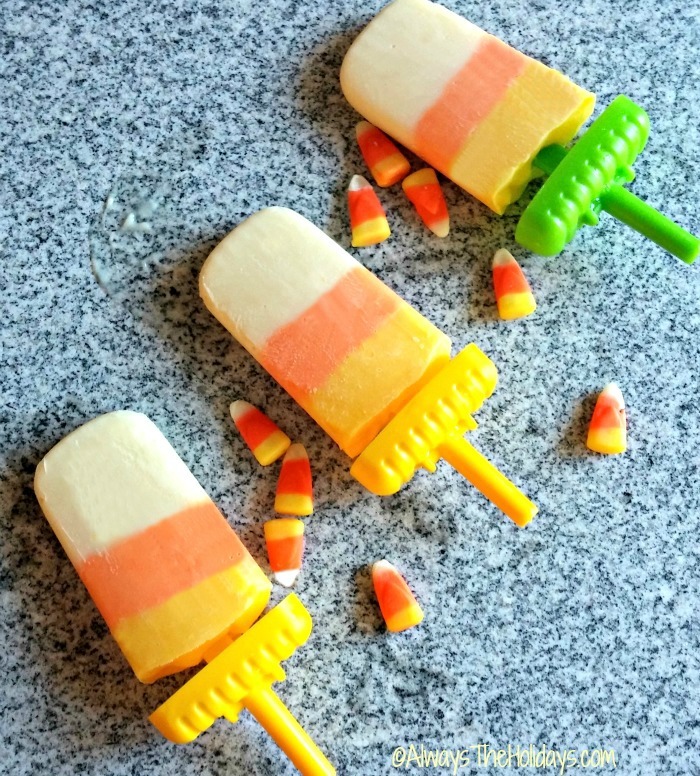 See how to make these edible candy corn treats. You won’t have to twist the kid’s arms to sample these on your Thanksgiving table? 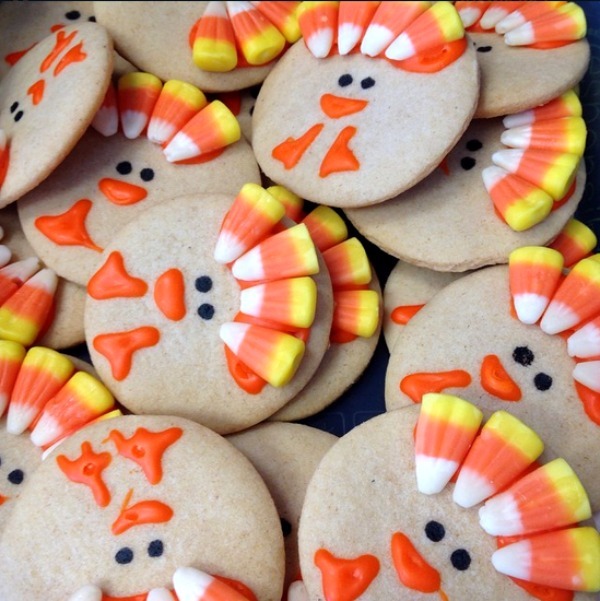 These adorable Candy corn turkey cookies from Craft Morning are easy to make too! 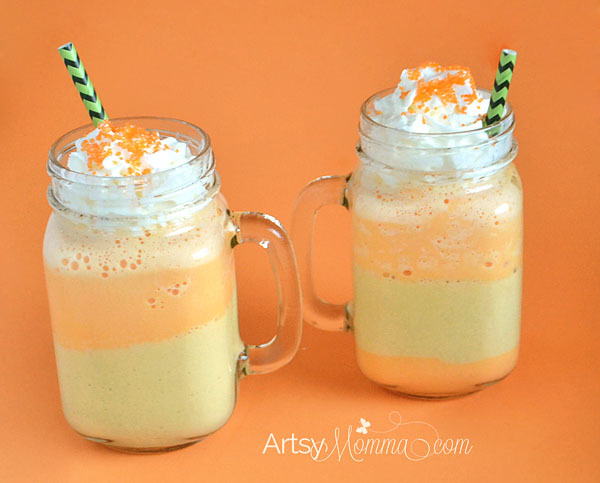 This delicious milk shake is inspired by our favorite fall candy. It is a scrumptious blend of orange sherbet, ice cream, bananas and other goodies. See how to make it on Artsy Momma. Still looking for more inspiration for candy corn recipes for your Halloween or Thanksgiving dessert table? Try one of these delicious concoctions! 2. 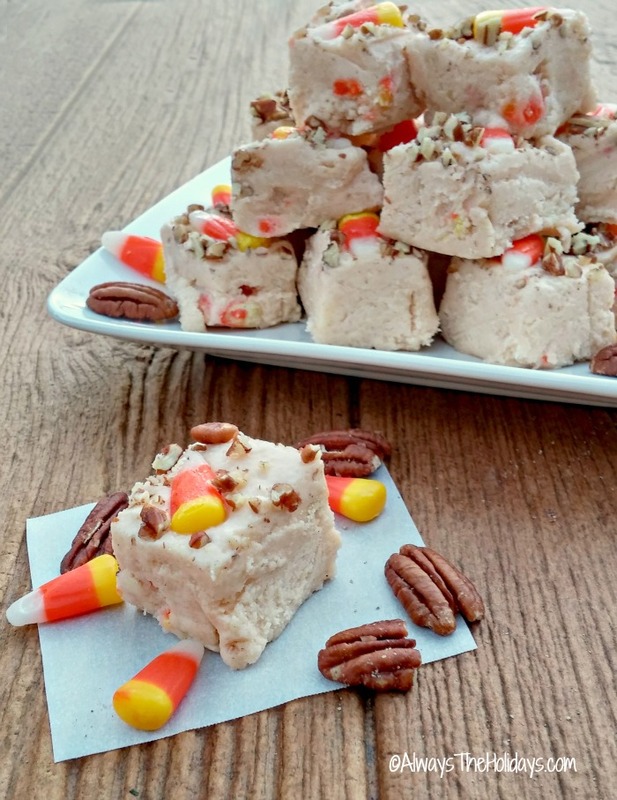 Candy Corn Marshmallow Treats. 3. Candy Corn Poke Cake. 4. Candy corn Oreo cookies and cream fudge bars. 5. Candy Corn Halloween chex mix. 6. Black Velvet Halloween Trifle. 8. White Chocolate Candy Corn Cookies. 9. Candy Corn Chocolate Bark. 11. Creamy Candy Corn Jello Cups. 12. Home made Candy Corn. What a great collection! I have to be honest and say that I don’t usually buy candy corn. But I may just have to pick some up and try some of these recipes.